What’s AHEAD Poll Results—College Affordability: Is Free Community College Tuition the Answer? In this poll, we asked higher education leaders to share their perceptions about college affordability and the possibility of making community colleges tuition-free. On Friday, September 18, 2015, Penn AHEAD's Laura Perna delivered a keynote address at the 2015 Kansas-Missouri Summit on Access, Persistence and Completion in Higher Education. Dr. Perna's speech focused on the importance of closing the gaps in college-related outcomes that persist across demographic groups. For a summary of her speech, please click here. Penn AHEAD, The Center for the Study of Race & Equity in Education, and Penn Admissions are co-hosting a one-hour film screening and discussion on Thursday September 24, 2015 from 12:0pm - 2:00pm at the University of Pennsylvania, Meyerson Hall Room B1. 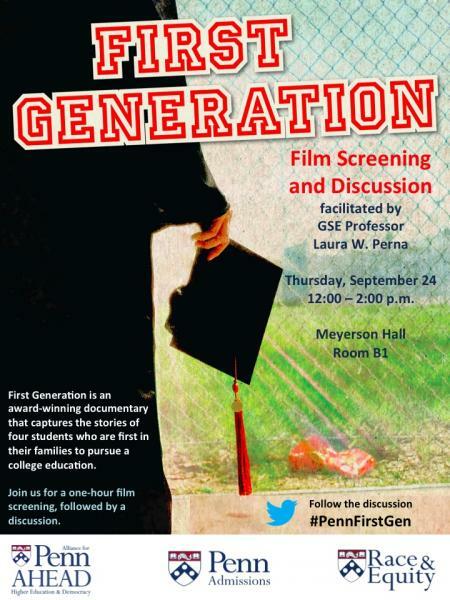 First Generation is an award-winning documentary that captures the stories of four students who are first in their families to pursue a college education. For more information, click here to view the event flier and click here to learn more. Penn AHEAD Senior Scholar Alan Ruby says that it's a pity the efforts of myriad institutions striving daily to help students of diverse backgrounds are eclipsed by Ivy League tales. What’s AHEAD Poll Results--Public Perceptions of Higher Education: Is it Worth the Cost? In this poll, we asked higher education leaders to share their perceptions on the cost and value of postsecondary education. We then asked these leaders to assess the perceptions of higher education’s value proposition among key stakeholders, responsiveness to stakeholders, and most common criticisms. 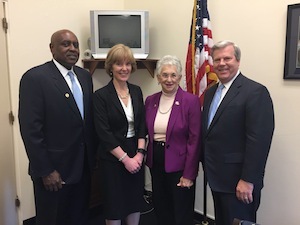 On April 30, 2015 Dr. Laura Perna, along with three other experts, testified before the United States of Representatives Subcommittee on Higher Education and Workforce Training on improving college access and completion for low-income and first-generation college students. Dr. Perna focused her testimony on best practices and gave recommendations to guide the Committee's consideration of college access and success programs. From July 20-July 21, 2015, Penn AHEAD is hosting an intensive two-day workshop that focuses on developing a personal leadership plan to prepare for effective future leadership and move your career ahead. This program provides individuals with personal feedback from Penn faculty and search consultants and concrete suggestions to improve their leadership skills. For more information and to register, please visit our event website. Dr. Lois Weis, State University of New York Distinguished Professor of Sociology and Education at the University of Buffalo, spoke at PennAHEAD on April 27, 2015 on her 2014 book "Class Warfare: Class, Race, and College Admissions in Top-Tier Secondary Schools." The event was co-hosted by the Alliance for Higher Education and Democracy (AHEAD) and the Center for the Study of Race and Equity in Education. PennAHEAD Executive Director Dr. Laura Perna spoke at the University of Buffalo Graduate School of Education on March 30, 2015 as part of the Dean's Distinguished Lecture Series. Dr. Perna's presentation focused on promoting college access and completion and the role of public policy and institutional practice. PennAHEAD Senior Scholar Peter Eckel joins Inside Higher Ed's Scott Jaschik and the moderator Casey Green to discuss the decision of the state higher education board not to renew the contract of University of Mississippi chancellor Dan Jones and the growing political pressure on public university leaders. Click here to listen to the entire segment.